The Social Profiles add-on gathers publicly available social data to help you learn about your contacts, find out who's the most connected, and who your most loyal fans are. Use this information to send targeted emails based on age, gender, or social networks. In this article, you'll learn about how to purchase, set up, view, troubleshoot, and disconnect Social Profiles. 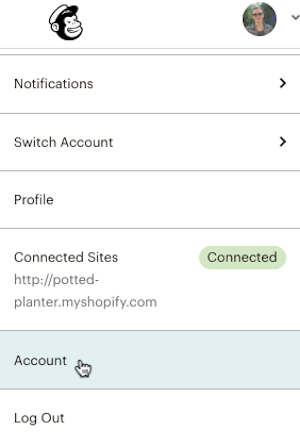 If you pause monthly billing on an account, you'll also need to disconnect Social Profiles so you're not charged for the add-on while you're away. Social data can't be exported. You can create and export segments based on Social Profiles data, but the export will not include that data. Social Profiles pulls in publicly available social data aggregated by FullContact. Social Profiles is an optional paid add-on for audiences that's available for Monthly or Pay As You Go Plans, and can be added to one or multiple audiences in your account. Social Profiles is not available for our Forever Free users. Social Profiles costs 10% of the monthly cost for the total number of subscribed contacts across all the audiences it's enabled for, whether you're on a Pay As You Go or Monthly Plan. To estimate the cost to add Social Profiles to an audience in your account, add up the total number of subscribed contacts in your audience, input that number in our monthly pricing calculator, and calculate 10%. For Monthly Plan users, billing for Social Profiles starts the day it's activated. 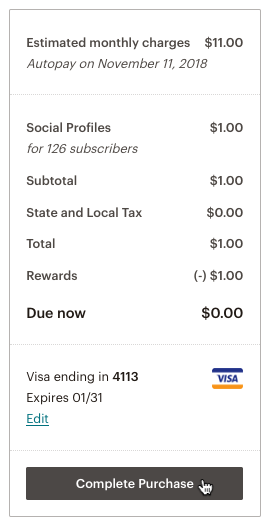 We don't prorate the monthly subscription fee, so you may want to add Social Profiles at the start of your billing cycle. After the initial charge, billing for Social Profiles is rolled into your monthly payment. Pay As You Go users are charged each month on the day that Social Profiles was initially activated. To add Social Profiles to an audience, follow these steps. Click your profile name to open the Account Panel and choose Account. 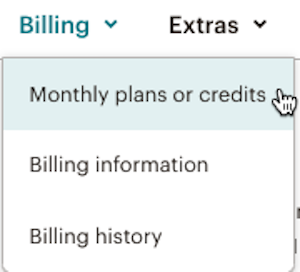 Click the Billing drop-down menu and choose Monthly plans or credits. In the Social Profiles section, find the audience you want to work with and click Add. In the sidebar, review or edit your choices, and input your credit card's CVV. After Social Profiles is added to an audience, allow anywhere between 1-7 days to populate data for your contacts. We'll check various social networks for email addresses in your audience, then gather information on your contacts' age, gender, and other publicly available data. After social data is collected for your contacts, Mailchimp displays this data in the audience stats and also in each contact's profile. To view Social Profiles data for an audience, follow these steps. Click the Stats drop-down and choose Social profiles. This page displays all of the data that Social Profiles has been able to gather about your contacts, including age, gender, and influence rating. A contact's influence rating is primarily based on how many friends, followers, and connections they have across their social media networks. Click Send to Segment for any item to create a new segment in the Campaign Builder, where you can create a campaign for those contacts. To view Social Profiles data for a contact, follow these steps. Find the contact and click their email address to open their contact profile. If you have a large audience, it may be easier for you to find contacts using our built-in search feature. In the bottom-right section of the contact's profile, you'll find that person's social data, which can include name, age, gender, company, and the social networks tied to the contact's email address. If your Social Profiles statistics don't look right to you, there are a few things that you can check for. I don't see any Social Profiles data. Check to make sure Social Profiles has been activated for your audience. I don't see as much social data as I expected. There are a few possible reasons your Social Profiles data might seem incomplete. Your contacts have restricted their information. If your contacts have opted out of FullContact's services, or set their profile to private, you will not have access to their social media information. Your contacts may use different email addresses for their social accounts. We are only able to populate information for the email address a contact used when they subscribed to your emails. We could have old data related to your contacts or their inactive social media accounts. Stats are cached so we don't overload FullContact's API. The size of your audience and the number of other requests in the queue can affect how long it takes to get this data. If you no longer need to use Social Profiles, you can remove it at any time. If you disconnect Social Profiles for an audience, you'll lose access to any previously collected Social Profiles data. To disconnect Social Profiles from an audience, follow these steps. In the Social Profiles section, find the audience you want to work with and click Remove. In the pop-up modal, click Delete Social Profiles.